It’s been a whole eight months since summer was last here. No wonder you need a relaxing escape! If you’re going on a seaside adventure, make your trip easier by packing light. 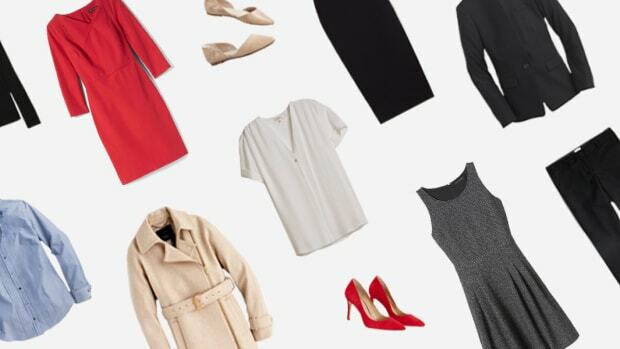 You might be asking yourself: “How am I going to look cute when only packing a few items?” Well, the key to staying stylish and economic is to bring only versatile, neutral, and flattering items. 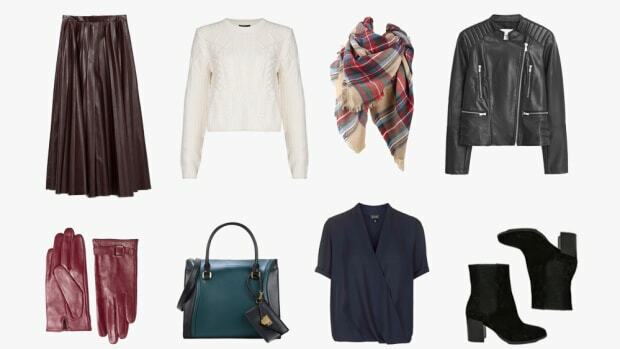 Take a look below at how we created fourteen outfits out of items that would fit into a carry-on. Now, that’s capsule packing. Bon voyage! A simple LBD will stretch your wardrobe way beyond your honeymoon, so this is a great piece to invest in. The classic silhouette of an A-line wrap dress is universally flattering and can be dressed up or down seamlessly. Day: Naturally, the wrap dress is more casual, so wear a pair of simple black slip-on sandals. Both the dress and shoes are casual, but the black color scheme immediately dresses up the look while remaining versatile in every way. To play up the tropical beach resort vibe, wear a straw hat and fun earrings. A casual tote bag is perfect for throwing in all of your beach gear, which is a must. Night: It’s all about the accessories. To amp up your wrap dress, wear a bold statement necklace and a sleek black purse (bonus points if it’s Chanel-inspired.) Be sure to pack a necklace that is more neutral so that it will go with any outfit. Heels are a sure way to make any outfit more fancy, so pack your most versatile wedges in white, cream, or beige. Now you’re ready for margaritas at the cantina! A bright white fit-and-flare dress is perfect for your beachy oasis because it suits the tropical vibe and still looks classy. Day: This dress is a little fancier because of its silhouette, but its eyelet fabric makes it easy to dress down. 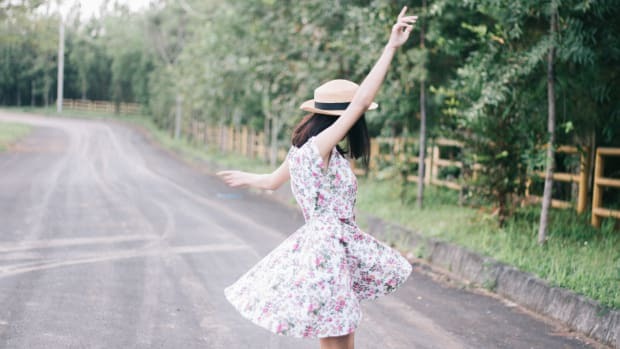 To make this a fun 1950s-inspired day look, wear your patterned sneakers. To dress it down even more, throw on a denim jacket and roll up the sleeves. Night: Transform this outfit by slipping on your sleek black sandals and toting your matching black purse. If you’re grabbing dinner in town after a day on the beach, wear your sun hat to glamorize yourself, and then top it all off with a pair of pearl studs. Who doesn’t love a little red dress? Although it’s the boldest of colors, red is surprisingly versatile. You’ve packed mostly neutral-colored accessories, so everything will go with it. 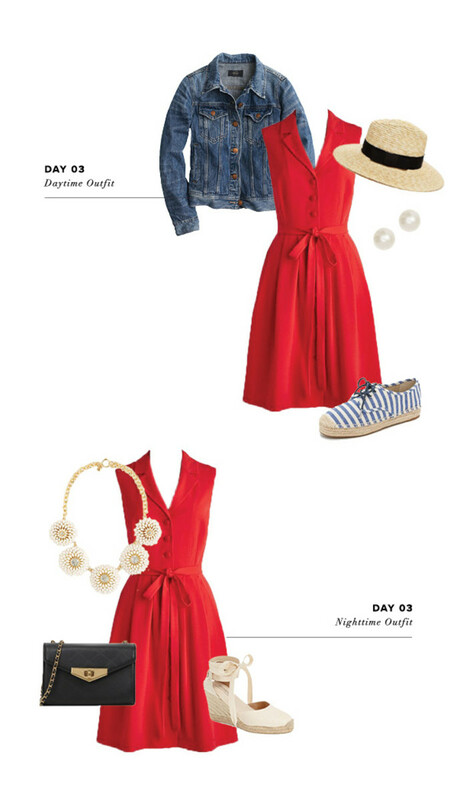 Day: This look is all about bright colors, so get patriotic with your red dress and blue striped sneakers. Keep up the playful spirit by wearing your straw hat and casual denim jacket. This look is great for adventuring—biking, exploring the nearby towns, and anything else that requires you to be comfortable in your outfit. Night: To make this dress nighttime-appropriate, bling it out with your statement necklace. Your classic black clutch will also dress it up, and your wedge espadrilles will immediately give you a dressier look. The maxi dress is the ultimate beach getup. Perfect for throwing over a bathing suit or for a classy dinner outfit, we know that the maxi dress will have us looking lovely all day long. Day: Before you head to the beach in just any old thing, choose your maxi dress as a cute cover-up over your bathing suit. Your sun hat will protect you from the UV rays and keep you lookin’ stylish. Night: To (literally) elevate this into a nighttime look, wear your wedge heels, and class it up with your black purse. Throwing on your denim jacket will make this look less like a beach outfit, and a pair of tassel earrings will add some color. Did somebody say beach bar? Let’s be real, one bathing suit isn’t going to cut it. Create an outfit to wear over it that is easy to transition into a nighttime look. Day: A white eyelet top is feminine and easy to wear with any colored pair of bottoms. You can’t go wrong with a pair of casual Bermudas, so make this an easy daytime look by throwing on your sneakers and straw hat. Night: As the sun slips away, you want to play up the classy lace blouse with your statement necklace and purse. By going extra-fancy with your accessories, you will create an overall look that is appropriate for a nighttime outing. 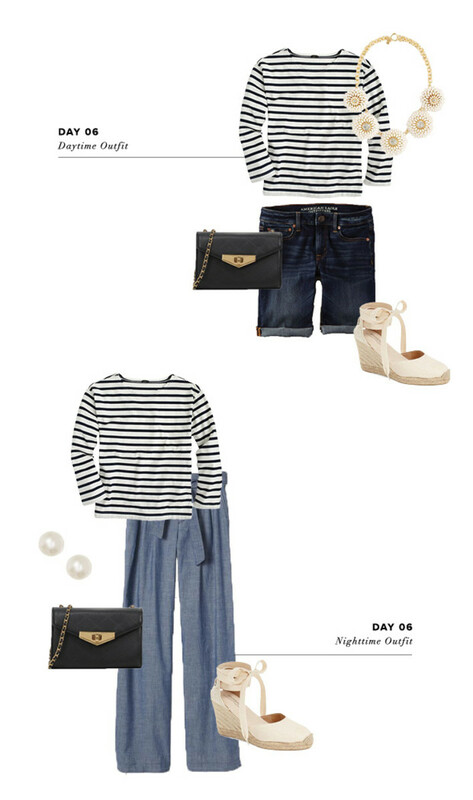 A Breton striped top is ideal for any beach getaway. Its nautical vibe will fit the occasion while also being endlessly versatile for both casual and fancier looks. 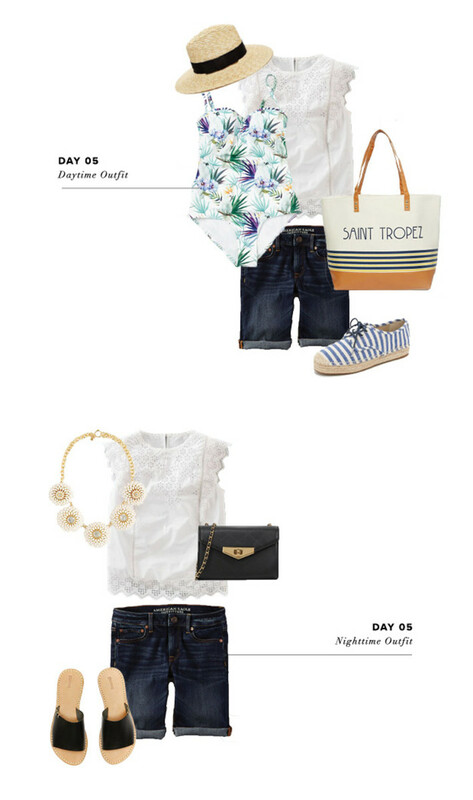 Day: For your daytime look, go preppy by wearing the Breton with your Bermudas and statement necklace. The stripes paired with the statement necklace will create a fun, juxtaposed casual-meets-fancy look. Your Bermudas will dress down your wedge heels while creating an adorable J.Crew-worthy ensemble. 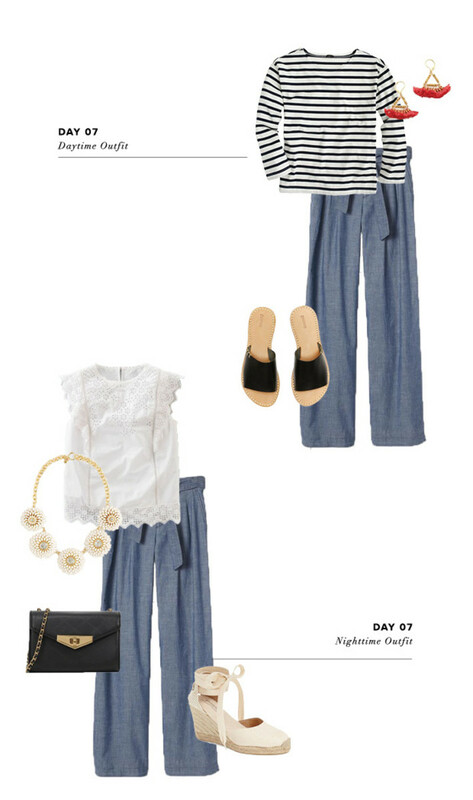 Night: To kick it up a notch, all you have to do is swap your bottoms for a pair of sailor girl–inspired wide-leg pants. The pants will create a French-inspired look, so swap out your statement necklace for a pair of classic pearl studs. The denim chambray fabric of your wide-leg sailor pants makes them perfect for any style, fit, and color of top and shoes. Plus, they’re probably the most comfortable pants you’ll ever be able to get away with wearing to a fancier occasion. Day: If you’re perusing the boardwalk after brunch, stay simple and classic with your Breton top, wide-leg pants, and slip-on sandals. For a splash of color, wear a pair of funky earrings to spice up your look. Night: Your white eyelet blouse will complement your chambray wide-leg pants perfectly, so all you have to do is add your fancier accessories for a more nighttime look. Your wedge heels will make your legs look miles long, and your statement necklace will take the whole ensemble up a notch.